The first project is a commuter bike for the girlfriend of my colleague. It is a wonderful Somec frame from the 1990's made with Columbus SL tubing. Together with the frame we got a Campagnolo Chorus Crank set, bottom bracket and a Chorus head set both from the 1990's. The frame has a 130 rear wheel space. At the time being we are in the concept phase, but we will make a classic design. News about A.D.A.M. 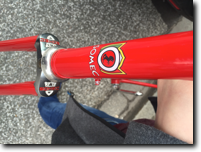 (my new project is called now): The frame has been arrived by end of last week and the paintjob looks like is has been done by the Colnago people themselves :-) amazing !